And welcome to Social Security Disability Claims ESP. Our parent company, JusLo and Associates, has been online since 2003 providing quality information on ways to recall health and wellness to the body, mind and spirit. You can read a little more about how the company started at Recalling Health.com. My name is Loretta and I am your site editor. I am also an ex Social Security disability examiner, having left my position with Disability Determination Services in August 2005. The goal of this site is to provide you with information on the Social Security disability process as it relates to services provided by the Disability Determination Services office (DDS) , a contractual arm of the Social Security Administration (SSA). This DDS is a state agency which employs disability examiners (DEs) who assist in making medical and vocational determinations on your Social Security Disability and SSI benefit claims. In some states DEs might also make Medicaid decisions. These examiners -- usually in consultation with staff medical consultants -- basically decide whether or not you are disabled using the guidelines and policies as set forth by the SSA. In some DDS offices, disability examiners can be certified and designated as "Single Decision Makers", which means they have the authority to make a decision on some claims without the input of a staff medical doctor or staff psychologist. You will learn all about the different players at the DDS office on this website as more and more information is added. So do bookmark this site and come back often for updates or you can subscribe to Claims ESP, my Free Disability Examiners Newsletter to be notified when the site is updated. 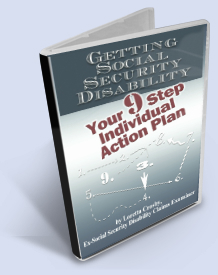 In October 2008, I completed an electronic book (ebook), titled: Getting Social Security Disability: Your 9 Step Individual Action Plan. You can learn more about it at 9 Steps 2 Disability. This downloadable ebook features tips and strategies to assist you in getting a quick and favorable decision on your disability benefits claim. It will also give you an inside look at how the DDS operates so that you will be better prepared to deal with your disability claims examiner. This title is also available to be downloaded onto your Kindle Reader, and in August 2011 became available in softcover edition for your reading pleasure. We recently added a Directory Listing of experienced disability representatives for those of you seeking help with your claim. There is no charge to you to receive a free evaluation through this service. Please click here for more information. Again, welcome to Social Security Disability Claims ESP, your online source for all things related to getting a faster, more accurate decision on your disability claim. I'm wishing you all the best as you go forward with your claim. Contact me and let me know what you think of this site. Comments and suggestions on what we might do to improve it are always welcome. Insider Information at Your Fingertips! "Social Security Disability E.S.P. ... Information to help you win your claim." Copyright (c) 2005-2016 Social-Security-Disability-ESP.com. All Rights Reserved.